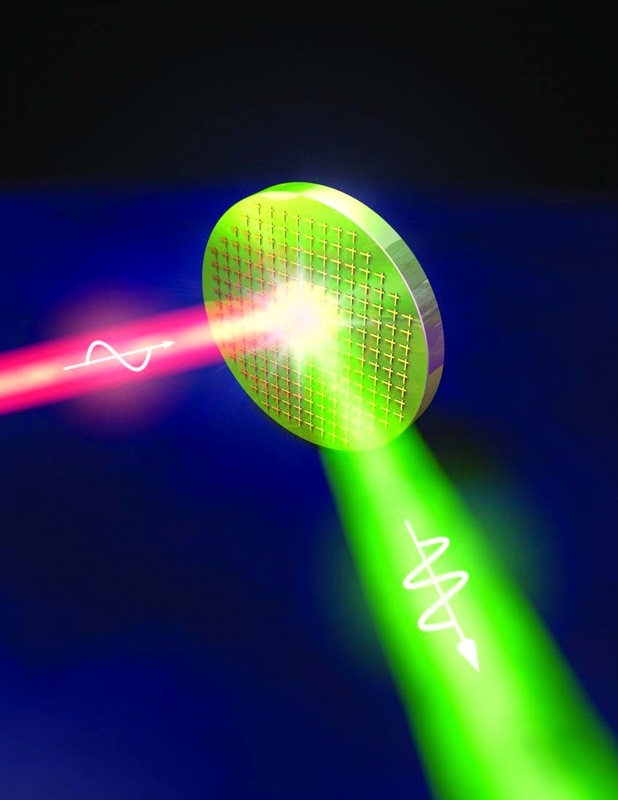 The invention, called a “nonlinear mirror” by the researchers, could help advance nonlinear laser systems that are used for chemical sensing, explosives detection, biomedical research and potentially many other applications. The researchers’ study will be published in the July 3 issue of Nature. The research team led by UT Austin’s Department of Electrical and Computer Engineering professors Mikhail Belkin and Andrea Alu, in collaboration with colleagues from the Technical University of Munich, has created thin-film nonlinear metamaterials with optical response many orders of magnitude larger than that of traditional nonlinear materials. 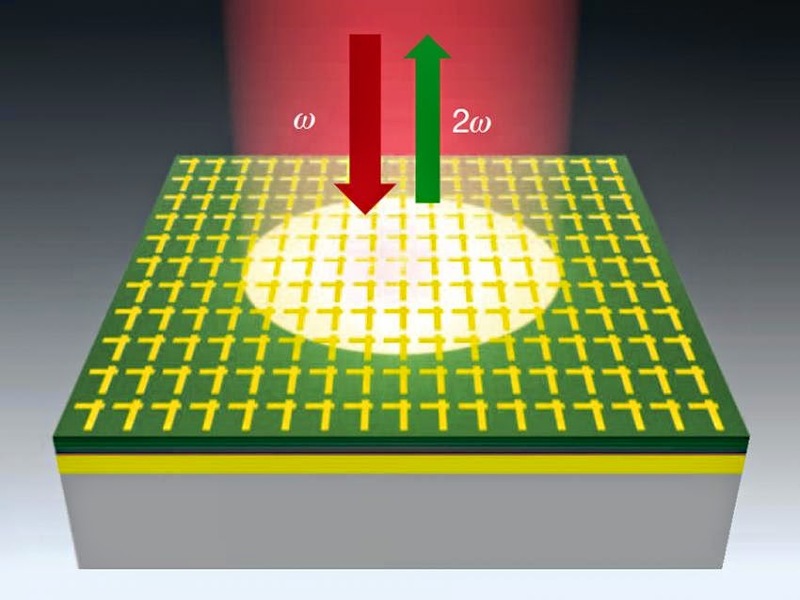 The scientists demonstrated this functionality by realizing a 400-nanometer-thick nonlinear mirror that reflects radiation at twice the input light frequency. For the given input intensity and structure thickness, the new nonlinear metamaterial produces approximately 1 million times larger frequency-doubled output, compared with similar structures based on conventional materials. “This work opens a new paradigm in nonlinear optics by exploiting the unique combination of exotic wave interaction in metamaterials and of quantum engineering in semiconductors,” said Professor Andrea Alu. “Alongside frequency doubling, our structures may be designed for sum- or difference-frequency generation, as well as a variety of four-wave mixing processes,” said UT Austin graduate student Jongwon Lee, the lead author on the paper. “Our work unveils a pathway towards the development of ultrathin, highly nonlinear optical elements for efficient frequency conversion that will operate without stringent phase-matching constraints of bulk nonlinear crystals,” said Professor Mikhail Belkin. The research was funded by the National Science Foundation, the Air Force Office of Scientific Research and the Office of Naval Research, as well as the German Research Foundation. The University of Texas at Austin is committed to transparency and disclosure of all potential conflicts of interest. All UT investigators involved with this research have filed their required financial disclosure forms with the university. Alu and Belkin have both received research funding for other projects from the National Science Foundation and other major public science foundations. Belkin has also received research funding for other projects from the companies Omega Optics, Anasys Instruments and Hamamatsu Photonics, and Alu from the AEgis Technologies Group. An alumnus and former doctoral student who worked on the project, Pai-Yen Chen, now works for Intellectual Ventures Inc.